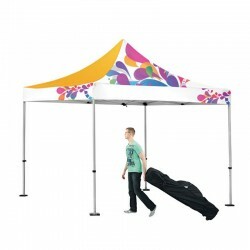 Outdoor products which include imprinted event tents, portable feather flags and outdoor banners for use at your next promotional event, trade show or retail advertising. Add your full color logo imprint or custom artwork to make a everlasting impression. 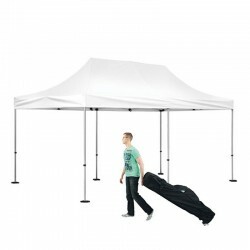 Portable Outdoor Pop up tent kit includes Area Imprint on White Canopy, truss aluminum frame and travel case with wheels. 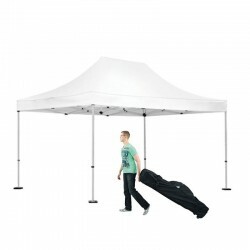 Portable Outdoor Pop up tent kit includes Valance Imprint on White Canopy, truss aluminum frame and travel case with wheels. 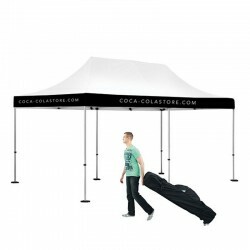 Portable Outdoor Pop up tent kit includes Full Color Imprint on Canopy & Valances, truss aluminum frame and travel case with wheels. 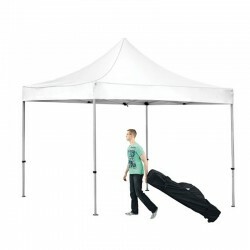 Portable Outdoor Pop up tent kit includes White Canopy, truss aluminum frame and travel case with wheels. 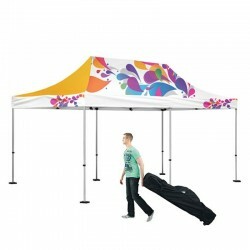 Our outdoor advertising displays feature event tents that are guaranteed to stop traffic at your next outdoor event. 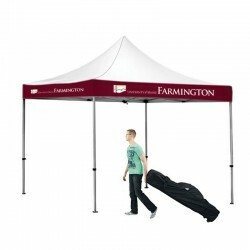 Offering many canopy options: Canopy with Full Imprint, Canopy with Area Imprint, Canopy with Full Valance Imprint, and Canopy without Imprint. AffordableDisplays.com has added brand new and exciting outdoor tent display options useful for any business or organization. Advertising Tents, event tents or ezup tents can also be used indoors as well as outdoors at any marketing or sporting event. They prove to be a great tool to build your brand or enhance product marketing, and are used in a variety of marketing campaigns. 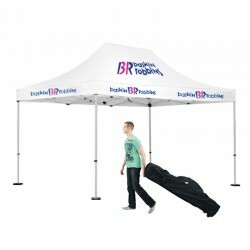 They are often used as a ticket booth, information booth, vendor tent, concession tent, sports tent, and a variety of other outdoor advertising venues. Our Advertising Tent is not you're ordinary truss tenting system - it's made to be resilient to wear and tear with continuous use by the frequent outdoor exhibitor. Providing added protection from the elements whether rain or sun, all you have to do is focus on promoting your product, service or brand. Made with industry specific water resistant Suntex FR, the woven polyester material has an special acrylic coating to add further resilience to your imprinting. 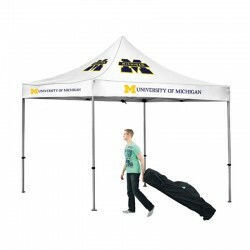 The tent frame is durable commercial grade aluminum and features hexagon-shaped legs to provide a stable base every time. The telescopic legs adjust at 5 height settings that range from 5.9’ to 7.0', provides 6.5’ of interior space and reach an exterior canopy height of 10.5’ when fully extended. To further secure your outdoor ezup tent, add on the Steel Weight Plates which would be placed on top of the large foot base of all legs. 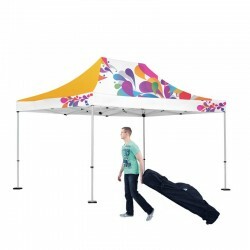 Some of our promotional ezup promotional tents are offered in 10x10 with Full color imprint, 10x15 with area imprint on white canopy or 10x20 with crisp blank white canopy. These outdoor tent signs can be disassembled and packed in one wheeled trolley bag and finished with D-rings with hook-and-loop adhesive around the bottom perimeter that is used to secure walls to the canopy. Take advantage of our in-house graphic designers to improve your image or submit your own ready to print artwork. Browse our outdoor trade show displays now to allow even more exhibiting options to your marketing schedule! 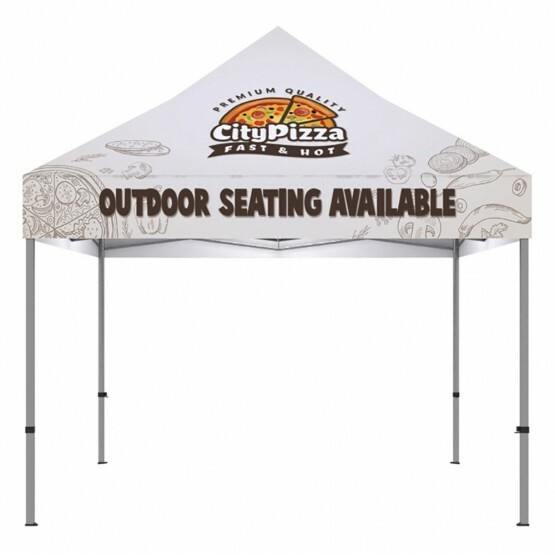 Outdoor custom printed event tents are an essential tool for all outdoor marketing events including a ticket booth, information booth, vendor tent, concession tent, sports tent, and a variety of other outdoor advertising uses. AffordableDisplays.com offers many already put together trade show display packages for you to choose from. Call 800-723.2050, chat or contact us and get started on your project today!